The built in version of the SS 500 - Same great grill, just without the cart. This is the perfect grill head if you are building a custom grill island or complete outdoor kitchen. If you have not eaten a steak that has been cooked on an infrared grill, you don't know what you are missing, and Saber is the best in the business. Infrared is unlike cooking on a traditional gas grill for a few reasons. First, you have different heating zones, allowing you to cook various types of food that require different temperatures all at the same time. So the days of cooking the steaks and then cooking the fish next is over. Second, the advanced infrared Saber technology gives you no flare ups, no uneven cooking and no dried out food. Just perfectly cooked flavorful food, every single time. Made from the highest grade materials with superior craftsmanship ensures that your Saber Grill will last for ages and will allow you to take your backyard culinary experience to a whole new level. The Saber SS 500 Built-In Grill will be the star of your new outdoor kitchen or island. 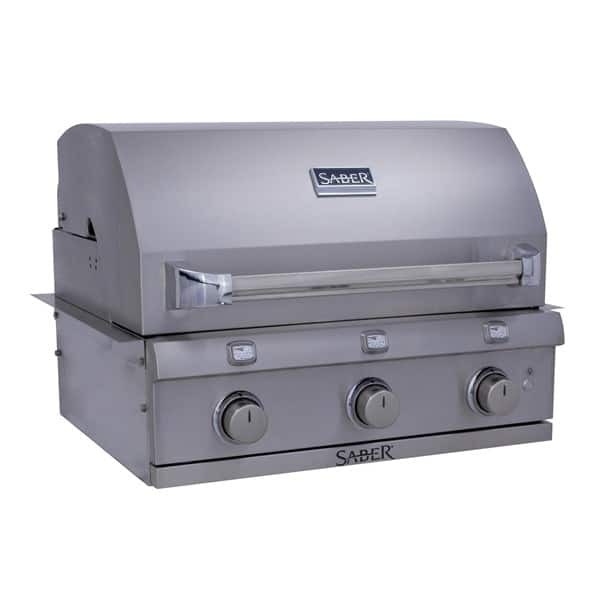 It is full-sized, and contains every amenity offered by Saber’s freestanding grills. 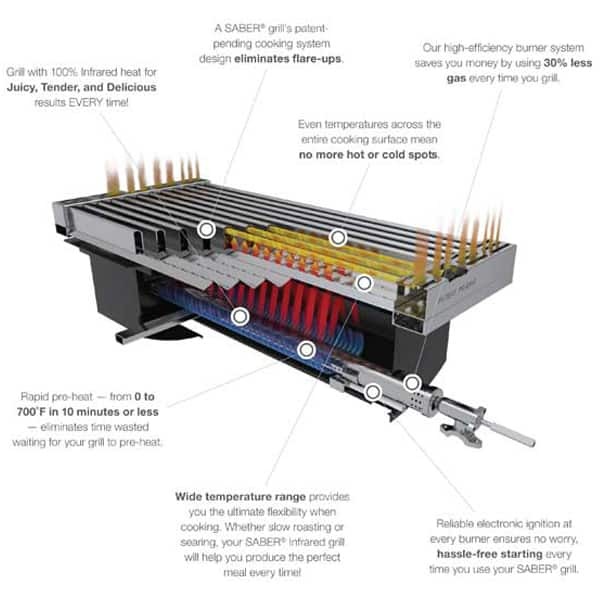 The Saber NG Stainless Steel Built-In grill has patented, cutting-edge infrared technology for 30% less natural gas consumption, even temperatures, and superior grilling performance. It is constructed with commercial grade 304 stainless steel, and features a welded tubular firebox frame. The grill has 675 square inches of cooking area equipped with 2 cooking zones which will allow you to adjust the cooking surface as needed. This permits you to save gas by heating only the area you need. Also featured is a push button electronic igniter at each burner to allow for convenient lighting. 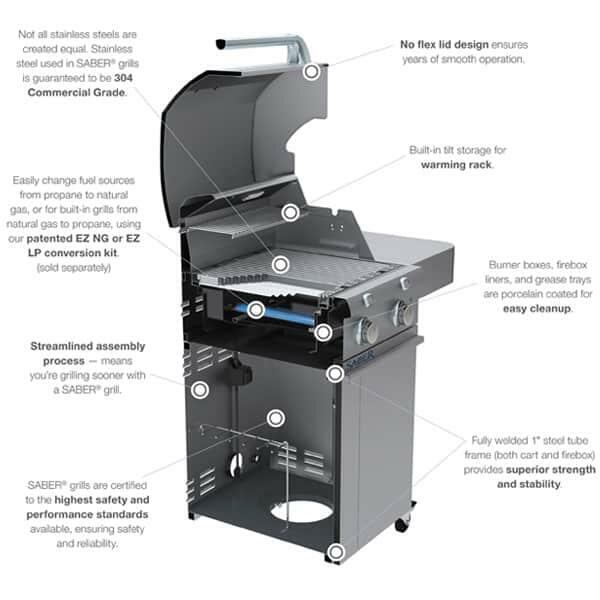 The 500 NG Stainless Steel Built-In Grill by Saber can be converted to propane with Saber’s exclusive EZLP technology.